I've talked briefly about adoption before, but I want to take the chance to mention it once again. 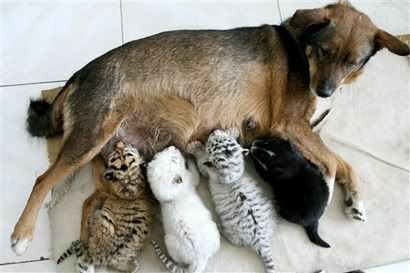 Notice how not a single one of those babies looks like the mama dog...not even her own flesh and blood puppy. She's still feeding them as her own, though, and will treat them as her own in every other way, too (until the zoo steps in here, of course). Kudos to all the parents, grandparents, aunts, uncles, older siblings, friends of the family--and the list goes on and on--who have stepped up and taken in children that they haven't given birth to themselves.